Indispensable tool in any dressing-table, it's easy to use and fast acting. This tool prepares multiple areas for treatment. Used on both the face and the body, it treats a wide variety of disorders. For use on the face or body with both yin and yang effects, this tool is very useful for treating inflammation of small joints. Its smooth sphere can be used for eye treatments. A balanced tool offering both yang and yin properties. It is generally used on the face but it can also be very useful for treating smaller body parts, including the fingers. An essential tool for facial and natural beauty treatments. The comet is a tool for detoxifying and creating balance. Its thick detector can be used for stimulation with delicate skin and the triple detector has a cooling effect. Highly recommended for stress management, the yin-yang hammer is a well-rounded tool that offers fast relief. Recommended for beginners, it is an alternative to the detector for precisely stimulating painful points on the face. Pack of 10 sticks of artemisia with a pleasant smell and the ash of which does not fall. Buring at a high-temperature, it assists to mobilize Qi by exercising a constant sweeping in three phases without the risk of burning the skin. Used in a variety of Dien Chan programs. Packet of 20 sheets, embedded with menthol and camphor. They can be cut up into ±700 heat patches for long-lasting, stimulating treatment. Dual detector to stimulate points of the face and reflexology areas. Very easy to use and convenient to carry thanks to its small size. Yang detector to stimulate points of the face and and reflex zones. Very practical tool to always have available. Easy to use on the face and body to relieve muscle tension, joint pain, stiffness, and for warming the extremities. It can be used to treat wrinkles, tone, and to combat fluid retention. On oily skin, use before applying any cosmetic products. A valuable resource in weight reduction and anti-cellulite treatments. It works to tone and sculpt larger areas of the body. The triple yang roller restores tone to the skin and muscles after a surgical procedure or weight loss. This ball has round-tipped stainless steel prongs and quickly brings yin effects to the stimulated area. It is convenient to use on any surface of the body, and can simply be used between the hands, offering immediate body relaxation. 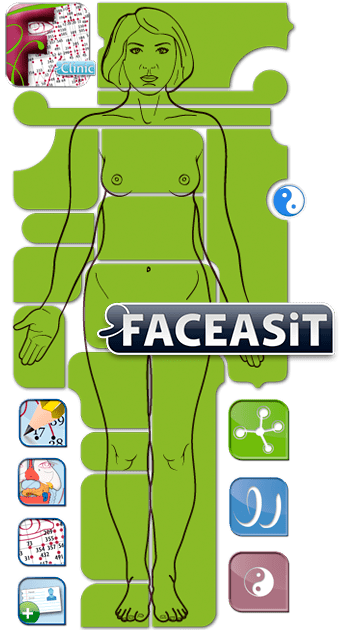 This tool is for both facial and body use. It relieves hot joint pain, relaxes extremities and reduces stiffness in the neck. It hydrates and drains the skin and can be used before applying cosmetics. 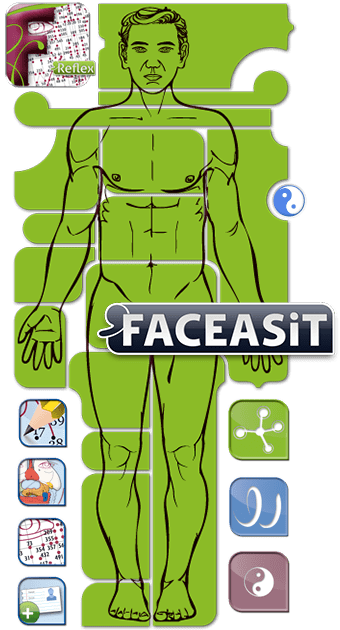 Nueva versión 2015 del libro en español más completo sobre el método original de reflexología facial, la Facioterapia - Dien Chan. Este iBook contiene una multitud de tratamientos así como el contenido del curso completo; mapas y esquemas en color e interactivos. Existe una versión papel en el *DienShop.com*. New 2014 spanish version. Also available in an english version. A valuable Dien Chan resource with colour diagrams of reflection. Ideal for the therapist or for self-treatment. The book is availbale in English, French, Spanish and Italian. The Dien Chan paperback book is abundantly illustrated with charts of reflection, diagrams of care and the map of fix points. Also available as iBook at *DienShop.com* The complete course book, it details how to use the multireflex tools to stimulate reflex zones and relieve a vareity of ailments. This book a tremendous resource to add to your health collection. Paperback French version of the complete course of Dien Chan. Our english version is available as an iBook for iPad only. Please visit *Books.multireflex.com* for more information.